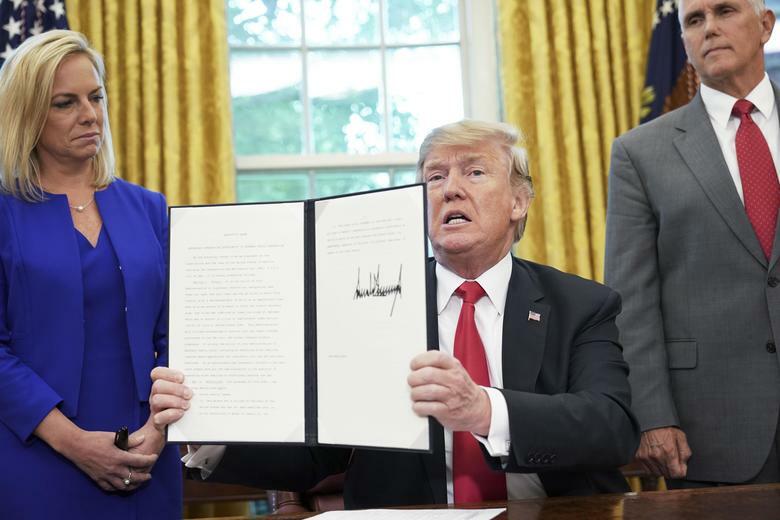 Watched by Homeland Security Secretary Kirstjen Nielsen and Vice President Mike Pence, U.S. President Donald Trump shows an executive order on immigration that he signed in the Oval Office of the White House on Wednesday in Washington. In the 12 hours since I wrote this poem / manifesto / cry of anguish-anger, the gang-boss (I hesitate to call him POTUS) of the National RICO Criminal Enterprise (aka the Trump-GOP Gang), has signed an executive order “to end” the gang’s kidnapping of refugee children from their parents—crimes against humanity. If the kidnapping stops, this is good. However, while Trump may now have signed the executive order (EO) stopping future family separations, the EO itself does not stop the criminal enterprise’s on-going crime of interring refugee seekers. 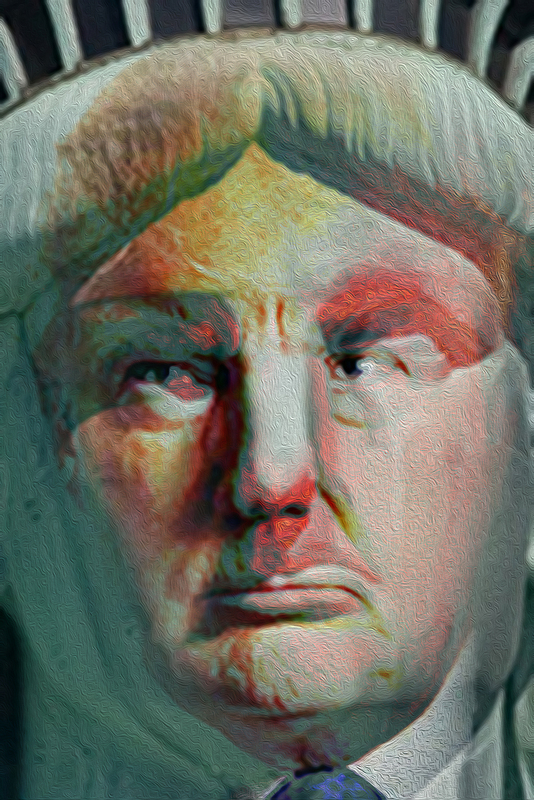 Trump’s just trying to slime his way into looking like a hero. All the EO does is produce the slime. “The order also did not provide any date or timeline on when it would be implemented and does not address how the more than 2,000 children already stripped from their families would be reunited. Health and Human Services (HHS) Secretary Alex Azar has said his department will begin working to return detained immigrant children to their families, but did not give a timeline. “And the president’s order does nothing to address the plight of the more than 2,300 children who have already been separated from their parents under the president’s ‘zero tolerance’ [sic—should read “kidnapping”] policy. 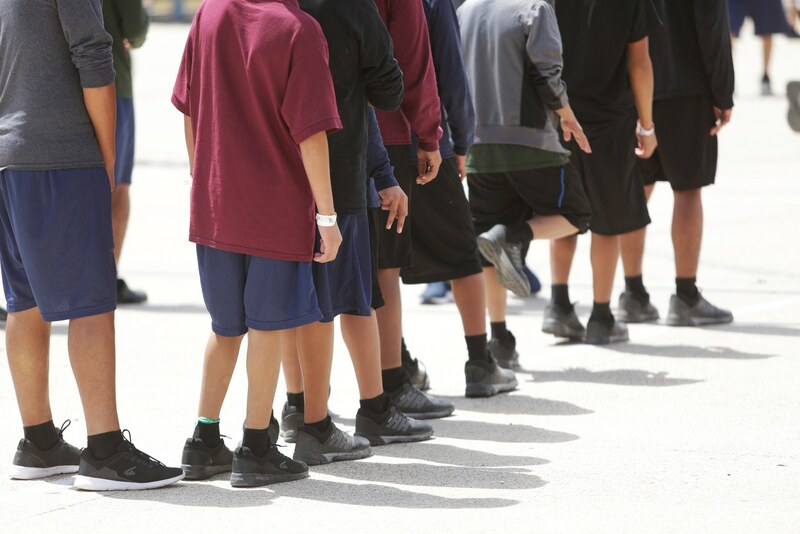 Federal officials initially said those children would not be immediately reunited with their families while the adults remain in federal custody during their immigration proceedings. The order has yet to arrange to return the children he already kidnapped. We shall see if gang-leader Trump even does what the EO says about stopping the kidnapping. 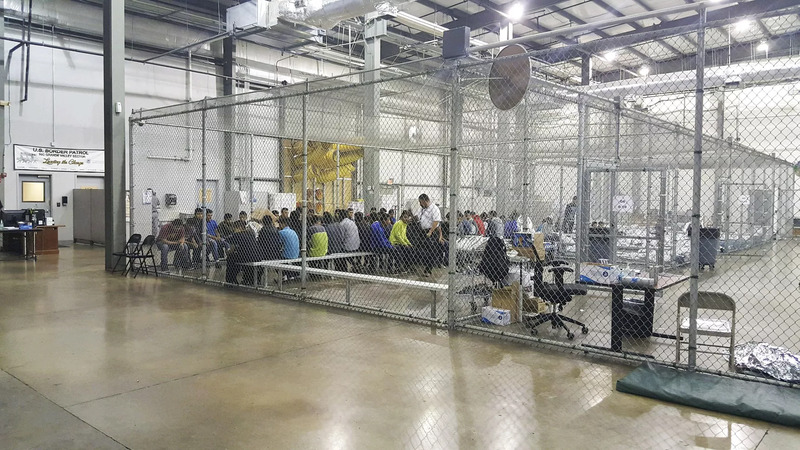 A government issued handout image of the US Border Patrol Central Processing Center in McAllen, Texas, on June 17, 2018. Notice that the Flores settlement from 1997, which both Trump and Sessions have blamed in part for their policy of separating children from their parents, apparently was against Sessions. This settlement restricts the time limit of holding the children to 20 days. A 2016 court ruling applied this to both accompanied and unaccompanied children. 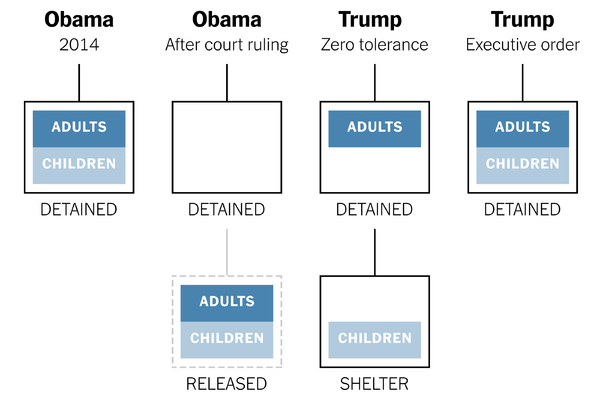 How the court rules on the filing could lead to the scenario Slate describes, of Trump continuing to blame the courts and Congress while he kidnaps children from migrant families. Or, the court could rule that the US may hold the children with their parents (interring both, but together), during the time it take for proceedings against the parents. In fairness, the EO does order that such proceedings be expedited. Still, the possibility is real that a prolonged court case (“proceeding”) could lead to indefinite detention, if the court allows the government to hold them until such proceedings are resolved. The Executive Order does not stop the crimes. It does not return stolen children, some lost, some abused, some whose parents have already been deported while the children remain interred, all traumatized. It does not assure these crimes against humanity won’t continue. The criminal interment of asylum-seeking refugees must stop now. The interment of all refugees must stop now. The kidnapping must stop now. Those who committed these crimes need to be pursued to justice. This is not over until all perpetrators at all levels of these crimes against humanity have been charged and brought to justice, possibly in The Hague as the chief of the US Justice Department is culpable. And these crimes against humanity must be prevented from happening again. This won’t finally be over until we honestly face our dirty laundry of atrocities and bigotry in the past and present, and in so doing change course so that our future is caring and just toward all of humanity. 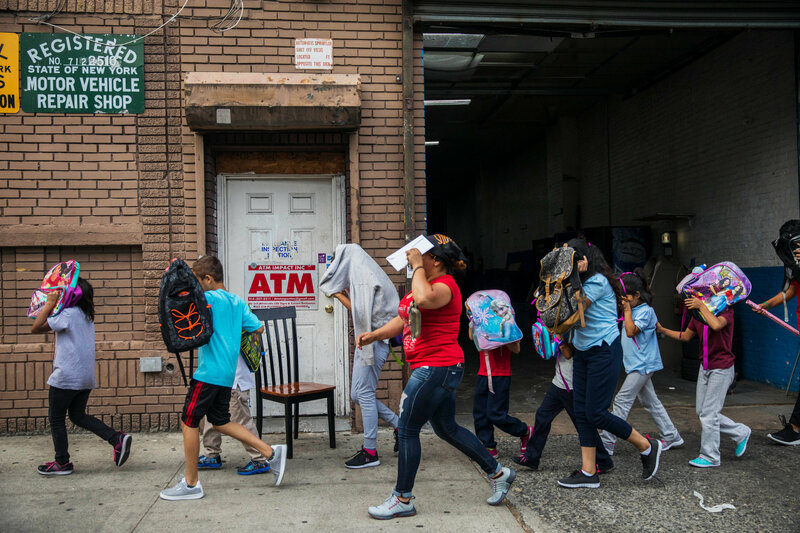 Children left the Cayuga Centers in Harlem on Wednesday. The shelter, which is working with children separated from their parents at the border, runs several programs. The Times could not independently verify which of the children were in programs for those separated from their parents. OF THE CIVIL RIGHTS AND ANTI-WAR MOVEMENTS. It’s time to hit the streets! Get in the faces of the fascists! CALL FOR NATIONAL PROTESTS ON 30 JUNE 2018! Click here to find a protest near you. Click here to list a protest you are organizing. Some organizations with government contracts related to the inhumane crimes against refugee children are listed here. 22 June 2018: Additional links added, including links to a list of organizations working to help the kidnapped children and a link to the full text of the Executive Order, as published on the White House site. Quotes from the actual EO have also now been included in the main text. The reporting from Time about the Navy planning to build more camps also has been added, as has a New Yorker image (from Reuters), caption, and link to a first-person account from a pediatrician who “treated” a separated migrant child. Previous Previous post: Got a revolution (got to revolution)! Next Next post: Is there really an “immigration crisis”?